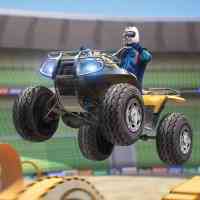 ATV 3D Arena Stunts: Get inside an arena behind the wheel of this awesome ATV and drive it very skillfully in order to perform the necessary stunts which will get you through this challenge. It is extremely important that you complete all your tasks before the time runs out and don't forget to park it in the end. You will have to go through loops and jump through circles in order to pass twelve intense levels. And that's not all, because you get to choose between fourteen amazing colors for your ATV. Are you excited? Have a blast playing this cool game!